Even when I left Milwaukee for a career in Arizona (staying there for about 30 years), I continued my membership (now 38 years) to retain a link that was very important in my observing. The MAS was very near the top of the things I missed having moved to this supposed observing paradise. Before I was old enough to join, I nagged my parents to take me out to the observatory for the open house nights. I marveled at the images in the telescopes that were so large they seemed like "dream" instruments. For me, the MAS Observatory always was and always will be a magical place. It is the place where astronomy happens. It is the place were astronomy comes alive. The observatory is the combination of almost eight decades of work by its members. Though many think that it has lost much of its luster due to the ever-increasing light pollution, it is a facility that is the envy of most clubs. It is the visual and very tangible legacy of the MAS. But an observatory by itself is merely a collection of instruments and their housing; a means to an end. What makes an observatory even more special are the observations that it makes possible. It may not be well known to the MAS membership, but many of the most prolific variable star observers had their roots in the MAS. In fact, the MAS probably leads all other organizations in its contribution to the study of variable stars. Various observers have contributed nearly 350,000 estimates to the AAVSO database. They include: Ed Halbach, Bill Albrecht, Gerry Samolyk, LaVerne Armfield, Walter Scott Houston, Bob James, Ray Zit, Tom Renner, Ralph Buckstaff, Gary Wedemeyer, Rudy Poklar, Neil Simmons, Chris Hesseltine. (If you know of other names I am missing, email me!) Happenstance? Don't believe it! The MAS has a genuine legacy. See the astronomy award winners of the Milwaukee Astronomical Society. Variable star observing has been important in the MAS from the very beginnings as an organization. The AAVSO donated a 13 inch mirror in the early thirties so the members could make observations. This became the so-called "A" scope named for LaVerne Armfield. Ever since, MAS members have been contributing their variable star observations and inspiring newer generations to this endeavor. I am proud to be a benefactor of this gift. When I was too young to join the MAS, I observed with a 4.5 inch telescope out of my backyard. Soon I longed to make serious scientific observations. I considered variable stars (AAVSO), meteor watching (AMS), and lunar/planetary (ALPO). For several nights I sought the variable T Cep but finally gave up all hope when the elusive object could not be found. Years later, the MAS legacy would intervene on one bitterly cold November night. I hauled my new 10 inch reflector to the observatory thinking because of the bitter cold I'd have the grounds to myself. Upon heading up the hill, however, I was greeted with a sight that reminded me of open house. Nine portascopes (10 inch Reflectors) were set up pointing in various directions, the binoculars were mounted on the power stand, and both domes were open. Just like open house, except no one was there- no one except Gerry Samolyk who was operating all of these scopes in succession. I was aware of the eclipsing binary program at the MAS, and to be honest, I wasn't all that impressed with all the equipment because I didn't really know what was going on. I actually thought that all Gerry was doing was running from scope to scope waiting for the "eclipse" to happen. 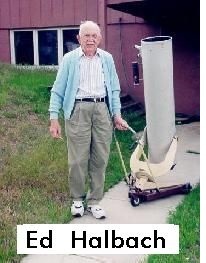 Needless to say, I was stunned when I learned that he was actually making a variable star estimate every time he looked through one of the scopes! Because of my familiarity with variable star observing, this was not just incredible, it was downright impossible. And it was especially impossible at the speed of one estimate per minute. I had not been in the observatory office except during the open houses. But on this night Gerry had the furnace on and it offered a 50 degree haven (and on bitterly cold nights that feels like you're in the tropics), and I was able to both warm up and talk to him about the observing. This night I was to discover the stacks of AAVSO charts. Organized in right ascension, there seemed to be hundreds of them. To me, this sent a strong statement that the MAS felt about variable star observing and the AAVSO. With this inspiration, less than a week later I would once again try for T Cep, but this time I would have success in less than 10 minutes. 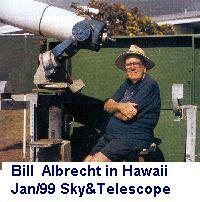 I would go on to join the AAVSO and observe EB's under Gerry's direction. Anyone who knows Gerry will tell you that 1) his energy is seemingly endless, and 2) he has a thousand stories to tell. I had the misfortune of getting involved with the MAS just after Ed Halbach and William Albrecht retired to Colorado and Hawaii, respectfully. But I came to "know" Ed (who set up the MAS Eclipsing Binary program) and Bill through Gerry's numerous stories. 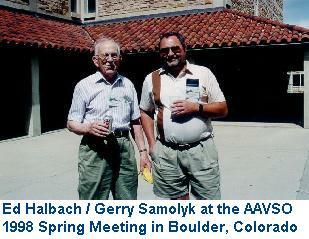 Ed Halbach attended the 1982 AAVSO meeting that was hosted by the MAS (i.e., me and Gerry) so I got to meet him first-hand. In a way this meeting made me sad because it made me realize the great loss of not being able to work along side him. 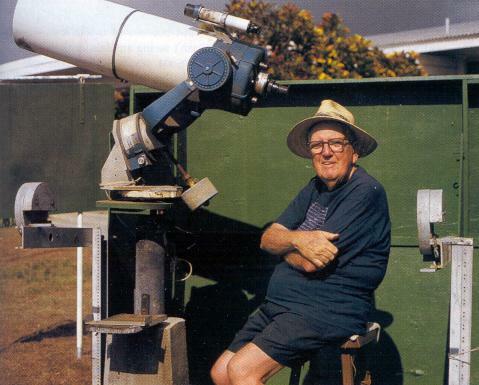 Ed received the very first Astronomical League's "Leslie P. Peltier Award" in 1981. But he would be followed by Bill who received this same award in 1999, myself in 2002, and Gerry in 2009. 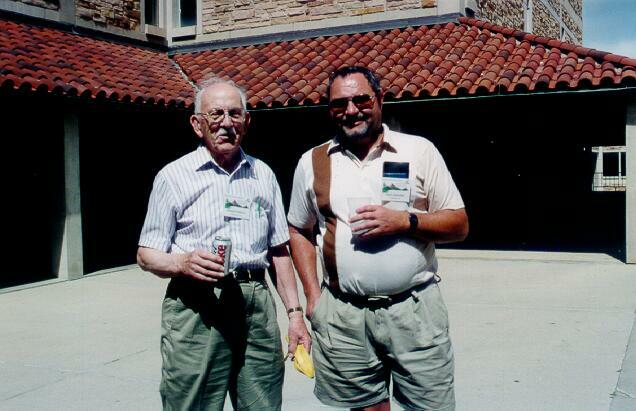 At the 1998 Spring Meeting of the AAVSO held near Ed Halbach's home in Este's Park, Colorado, I skipped the trip to Mount Evans and visited Ed instead. The story and pictures. Besides the thousands of variable star estimates I record every year, I actively mentor new variable star observers. I am of the strong opinion that every newbie in VSOing needs at least one mentor. It is hard for me to measure the importance that Gerry Samolyk had on my observing. A mentor does more than just teach various aspects of VSOing. A mentor answers questions, gives advice, tells stories, and simply makes you feel that you're not in this alone. In my case, Gerry in an off-hand statement allowed me to overcome my devastating position angle effect. Without this help I might have concluded that I could not make accurate visual estimates and quit before ever giving it a fair chance. Though you might think it nobel that I spend a considerable amount of time in the mentor program, I assure you there's more than just the thrill of developing new variable star observers. I feel I get just as much out of it! Even though most of my contact is through email, these personal contacts make a considerable difference.